When you play golf in Branson, you will find it tough at times, and it is even more challenging during the cold months. If you live in a place with year round warm climate, you will find that playing golf during the cold months requires determination and some creativity. If you are one those persistent golf enthusiasts who keep on playing – even with snowy greens and cold weather – you need to learn some important tips to keep you on top of your game. If it’s pretty cold outside, it’s impossible to play golf in Branson. So bring the golf course inside with Full Swing simulators. With golf simulator, you get all the best of real golf play without the sharp cold winds of the outdoors and no lost balls. Many indoor golf centers also feature some of the world’s most famous courses like Augusta, St Andrews, and Whistling Straits. This way will save you the long commute and is probably the only way to actually play them even if you’re not a pro. You can choose Top Golf, Urban Golf and other indoor golfing locations. 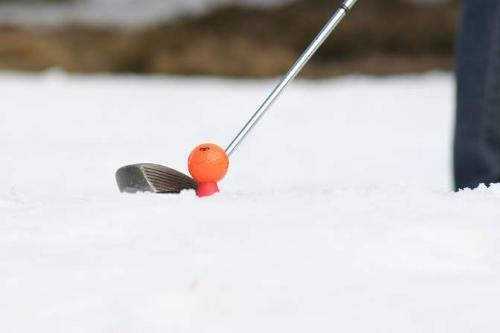 If you cannot resist venturing out and hitting a few balls at your local club, then snow golf is your option. Snow golf is already played by many committed golfers, it involves fewer clubs, fluorescent balls and nearest to the hole wins rules. Some golf courses allow players to play on through the winter. But you should be able to move snow away from around the ball to prepare for your shot by shoveling or flattening the ground. Use a 7-iron as opposed to a putter on the green. The good thing about playing golf in thick snow is that you can learn about your swing by seeing your swing path after taking a stroke. Even if you don’t play well in the snow, you’ll have the chance to improve your game all-year round. If you really want to improve your golf on winter, walk instead of ride. As you do this, you’ll be surprised how much walking will warm up your body. You’ll stay looser and your swing makes good results. Keeping your hands warm is another great way to improve your golf swing. While walking can help keep your body warm, it’s also equally important to keep your hands warm. With hand warmers in your pocket, it can warm your hands faster. Consider also wearing two gloves. When your hands stay warm, you don’t easily lose control or finesse over the golf club. You need to keep your golf ball warm. You should know that golf balls don’t travel as far in cold weather. Depending on air density, you’ll lose about 3 to 5 yards for every 10 degree drop in temperature. So, always keep that golf ball in your pocket between holes. When you play golf in Branson and want to try winter golfing trip someday, learn some of the important tips that can help improve your playing golf on winter.